Product #60539 | SKU ESR-TR01 | 0.0 (no ratings yet) Thanks for your rating! 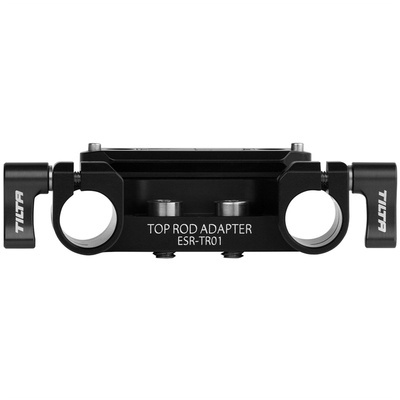 This Tilta Top 15mm Rod Adapter for Arri Alexa Mini Camera Cage is designed to be used with the Tilta Camera Cage for Arri Alexa Mini. It’s mounted to the top of the cage to provide a 15mm LWS rod setup from the top of the camera from which you can attach the EVF holder or any other accessory that you’d like mounted to the top of your setup. A NATO rail is mounted to the top of the adapter which allows you to slide on and off the cage’s top handle. Internal circuitry from the Tilta Long Top Plate for Arri Alexa Mini is transferred through this adapter to provide power up through the top handle, allowing you to power additional accessories with the optional Top Handle Power Connection Module.